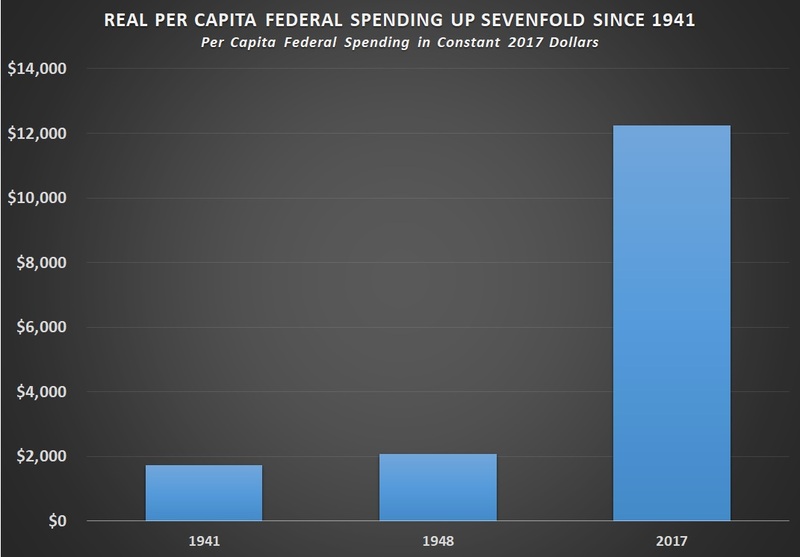 Real per capita federal spending has increased more than sevenfold since fiscal 1941, which concluded on June 30 of that year — or about five months before the Japanese bombed Pearl Harbor. In fiscal 1941, real per capita federal spending was approximately $1,718. In fiscal 2017, which concluded at the end of September, it was about $12,239. Back in 1941, at the beginning of Franklin Delano Roosevelt's unprecedented third presidential term, the federal government spent $13,653,000,000, according to the White House Office of Management and Budget. Although that was a massive increase from the $4,598,000,000 the federal government had spent in 1933, when Roosevelt first took office, it was a pittance compared to what it would spend in the years to come. The national population was about 133,402,471 in 1941, according to the Census Bureau, which means the approximately $13,653,000,000 shoveled out by the Treasury that year equaled $102.34 per capita. Converted into September 2017 dollars using the Bureau of Labor Statistics' inflation calculator, that equals $1,718.33 in real per capita federal spending. Over the next four years, as the United States fought a world war in both Europe and the Pacific, real per capita spending understandably escalated. In fiscal 1945, at the height of the war, federal spending hit $92,712,000,000 while the national population reached 139,928,165. Per capita spending that year was $662.57 or $9,035.08 in 2017 dollars. Federal spending initially tailed off after the war, but it did not return to prewar levels. By fiscal 1948, it was down to $29,764,000,000. With the population at 146,631,302, that equaled about $202.99 in per capita spending or $2,078.91 in 2017 dollars. That $2,078.91 in real per capita spending in fiscal 1948 was still $360.58 (or about 21 percent) higher than the real per capita spending of $1,718.33 in fiscal 1941. In fiscal 2017, the federal government spent $3,982,000,000,000, according to the Congressional Budget Office's Monthly Budget Review. With the Census Bureau estimating that the population was 325,344,115 as of July, that makes per capita federal spending in fiscal 2017 about $12,239.35. That is $3,204.27 (or about 35 percent) higher than the $9,035.08 in real per capita spending in fiscal 1945 — at the height of World War II. It is more than seven times greater than the $1,718.33 in real per capita spending the federal government did in fiscal 1941 — the last fiscal year before World War II. Measured against the population of the country, the federal government is now seven times bigger than it was when FDR started his third term. Is it seven times better? What are Americans getting for this massive increase in the federal government? In fiscal 1940, under Roosevelt's New Deal, 43.7 percent of federal spending went to "human resources," which in OMB's terms included: education, training, employment, social services, health, income security, social security, veterans' benefits and services. Only 17.5 percent went to national defense. In fiscal 1941, with World War II raging in Europe, national defense jumped to 47.1 percent of federal spending and "human resources" dropped to 30.5 percent. In fiscal 1945, 89.5 percent went to national defense and only 2.0 percent went to "human resources." In fiscal 2016, only 15.4 percent went to national defense while 73.2 percent went to "human resources." The 43.7 percent of federal spending that FDR's administration dedicated to "human resources" spending in 1940 equaled 4.2 percent of GDP. The 73.2 percent Obama's administration dedicated to "human resources" in 2016 equaled 15.3 percent of GDP. America was founded with a federal government whose primary function was to protect the liberty and independence of the people. We now have one whose primary activities make people dependent on the state. We need more self-sufficient people and less government. That will require a rare class of politicians who seek power in the federal government to diminish the power of the federal government — and who do not change their minds once the people have entrusted them with that power. Terence P. Jeffrey is the editor-in-chief of CNSnews.com.